British charity ‘Save the Children’ has warned that 5 million children are at risk of famine in Yemen as the Saudi-led coalition continues its devastating war on the impoverished country. On Tuesday, the coalition launched a campaign to control Yemen’s port of Hodeidah, according to state media in the United Arab Emirates, a partner in the coalition. ‘Save the Children’ has said that damage to the port or its temporary closure would increase food and fuel costs, putting 1 million more children at risk of famine. ‘Save the Children’ International CEO Helle Thorning-Schmidt said the “nutrition crisis… has serious implications” for the country’s young. “Millions of children don’t know when or if their next meal will come. In one hospital I visited in north Yemen, the babies were too weak to cry, their bodies exhausted by hunger. This could be any hospital in Yemen,” Thorning-Schmidt said. “What happens in Hodeidah has a direct impact on children and families right across Yemen. Even the smallest disruption to food, fuel and aid supplies through its vital port could mean death for hundreds of thousands of malnourished children unable to get the food they need to stay alive,” she said. The port is a “vital lifeline” for goods and aid for 80% of the country’s population, the organization estimates. 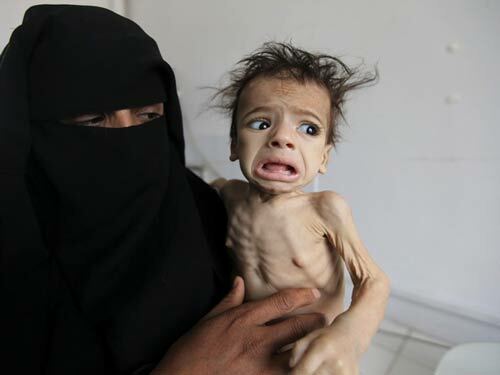 “Even the smallest disruption to food, fuel and aid supplies through its vital port could mean death for hundreds of thousands of malnourished children unable to get the food they need to stay alive,” said Tamer Kirolos, ‘Save the Children’s’ country director for Yemen. The United Nations has said an assault on the port city could, in the worst scenario, could kill up to 250,000 people. Around 70% of humanitarian aid passes through the Red Sea port. The military offensive in the province started in June but fighting stalled, especially in Hodeidah, as the UN tried to bring warring parties to the negotiating table. The latest attempt was in Geneva earlier this month but the Houthis didn’t travel as all sides blamed each other for obstructing the peace talks. ‘Save the Children’ provided testimony from Yemenis struggling to provide for their families. A woman identified by the pseudonym Manal said that her infant daughter turned skeletal after she suffered from malnutrition. “When Suha was six months she became sick,” she told Save the Children, which also changed the name of her daughter. Famine is just one humanitarian crisis facing the country’s beleaguered civilians. Last month, the World Health Organization (WHO) warned that the war-ravaged country is teetering on the brink of a third cholera epidemic. Cases are increasing near the capital, Sanaa, and Hodeidah, where the recent Saudi-led assault has hindered WHO’s efforts to prevent the disease. “We’ve had two major waves of cholera epidemics in recent years, and unfortunately the trend data that we’ve seen in the last days to weeks suggests that we may be on the cusp of the third major wave of cholera epidemics in Yemen,” Peter Salama, WHO deputy director-general of emergency preparedness and response, told a UN briefing in Geneva, Switzerland. The Saudi-led coalition has also been involved in killing civilians, some of them children, including in a devastating attack on a school bus in August. The bomb used in that attack was a 500-pound (227 kilogram) laser-guided MK 82 bomb made by Lockheed Martin, sold as part of a US State Department-sanctioned arms deal with Saudi Arabia, munitions experts told CNN.